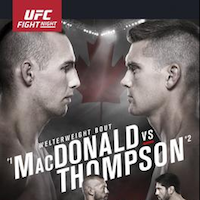 UFC Fight Night 89 weigh-ins are in the books as top welterweights Rory MacDonald and Stephen Thompson prepare to square off in the Octagon in Ottawa, Canada on Saturday, June 18. UFC Fight Night 89 will take place from TD Place Arena and will broadcast live on FOX Sports 1, with early prelims streaming on Fight Pass. MacDonald and Thompson both weighed in at 170.5 pounds, while co-headliners Donald Cerrone and Patrick Cote came in at 171 pounds and 170 pounds, respectively. * – Randa Markos loses 20 percent of purse to Jocelyn Jones-Lybarger for missing weight by 1.5 pounds.